It has to be tough to be one of Bob Marley’s sons: You are forever living in the shadow of one of the greatest artists of all time. However, Ky-mani Marley has a special spirit. He seems to be a man of the people like his father. I’ve always enjoyed the fact that he is the hip-hop artist in the family. Hip-hop has given Ky-mani a space to step out of his father’s shadow. At a recent show in Playa Negra, Puerto Viejo, he managed to mix hip-hop and reggae sensibilities in a way that was very entertaining. I was in Puerto Viejo with my family, but didn’t buy a ticket for his show: To be honest, I was afraid it might go as badly as the Chronixx show I attended in San José at La Rumba in September, where technical problems left the audience waiting for more than two miserable hours. I decided to see where Ky-mani’s Oct. 10 show would take place before purchasing the ₡20,000 ($40) ticket, and my intuition paid off. The concert stage was set up in front a muddy area the size of a football field directly across from Playa Negra. The stage was large and high, and the sound system was state-of-the-art, but the concert was happening in the wrong venue. This was the second reggae concert I had attended in a month where the promoters of the show just didn’t plan the event properly. I thought about the idea of Ky-mani singing to a crowd stuck in the mud, and felt disappointed. This should not be his Costa Rican experience. By virtue of the Marley name, he should have access to the best venues in the world. I decided I could just enjoy the concert from outside the venue, because the stage was facing the road that divided the muddy concert area from the black sand beach. Ky-mani started his set off with “Roots, Rock, Reggae” by Bob Marley. It was an excellent choice, but it got me thinking about his father’s music. This made it hard not to make comparisons. As I danced and watched from the road amid clouds of ganja – there was no smoke-free zone anywhere, of course – I noticed that the muddy area was empty. The whole crowd was crammed near the stage on a concrete strip– the designated VIP area– avoiding dancing in the mud. To Ky-mani’s credit, he did not let the strange setting distract him. He represented his family name with his whole spirit. There were more people watching outside from the street than inside near the stage, with about 500 outside and 200-300 inside. Where are the believers who believe in life? That would risk it all just to do what’s right. This song seemed to be an anthem in support of the #BlackLivesMatter movement in the United States. Ky-mani stays in the tradition of his father by keeping his music relevant to political issues of the day. As a true Rasta, he had to do a song in support of smoking marijuana. His latest ode to cannabis is not subtle: It is called “Get High.” However, this command wasn’t necessary in Puerto Viejo. You might say he was preaching to the choir when he sang, “Mek we get high… gwan build your spliff burn it and push it inna di sky.” The crowd was already sky-walking by the time Ky-mani introduced this new anthem. He ended his set with the Bob Marley classic “One Love.” This could have been a corny moment, because, let’s face it: Every reggae band in the world plays “One Love.” However, Ky-mani seemed to be singing the song as though the lyrics had special meaning for him. It was touching to hear that classic bass line spreading out across Talamanca amid the sounds from the sea. Everyone left the concert feeling good. Even the mud couldn’t stop Ky-mani from being a class act. I found a video a couple of days after the concert of Ky-mani dancing with Los Rumberitos de Puerto Viejo. They are a group of children who are being trained by Carter Van Houten, a local percussionist in Talamanca, and I learned that they had been one of the opening acts for Funk in the Jungle. When I saw the video of Ky-mani dancing and singing with the children, I realized that he knows the meaning of “pura vida.” He had no problems with a mash-up of mud and sand because he is a man who knows his father’s humble start in Trenchtown, Jamaica. 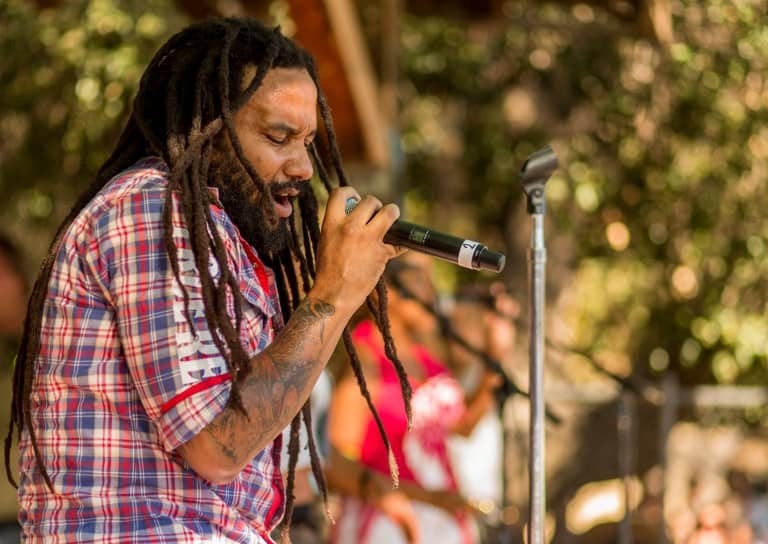 Ky-mani Marley is a tree that has not forgotten his roots. Masauko Chipembere is a singer-songwriter who was born in Los Angeles while his parents were in exile from Malawi. He is best known internationally for his work as part of the acoustic duo blk sonshine. He is a Nelson Mandela 46664 ambassador and was nominated for a South African music award in 2010. In 2014 he was given a Limón Roots award in Costa Rica for his unique musical contributions to the local scene. He lives in Heredia with his family. Check out his music here, or reach him through Facebook.